Richard Van Camp posted a link to this incredible picture a few days ago on Facebook. It jumped out to me and drew me in; it still does. 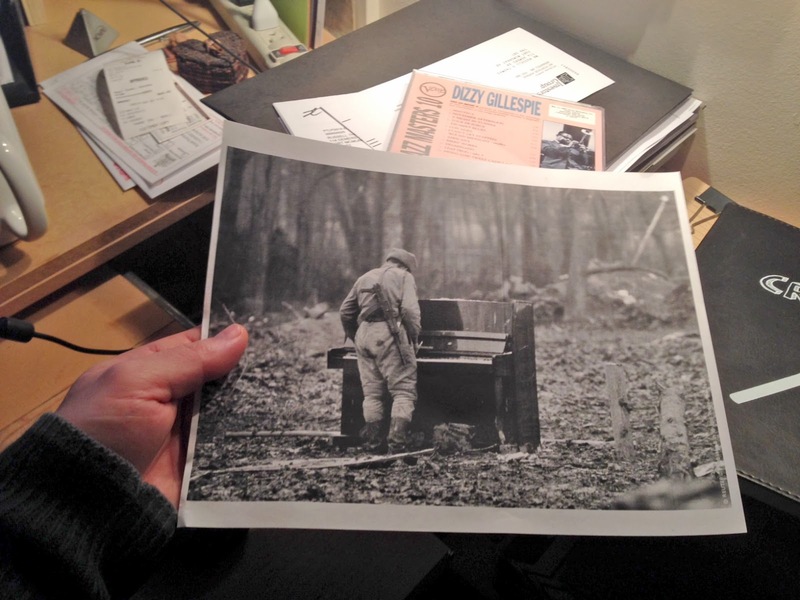 I printed it off immediately, intent on sketching it out as the composition is so interesting. It suggests a story that is complex and curious. 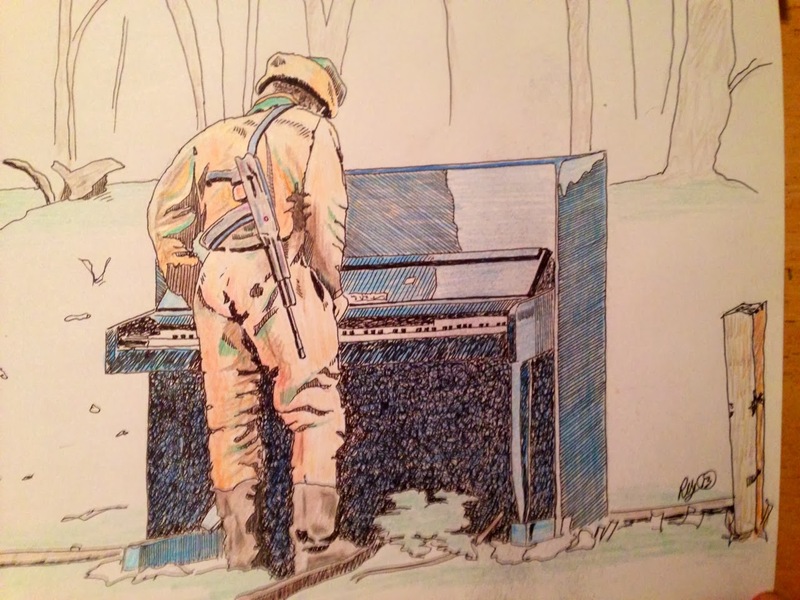 If a piano falls in the forest, does anyone hear? But seriously, what the hell is this piano doing in the middle of the bush? It certainly wasn't rolled there; it was more likely to have been heaved from the back of a truck. Unless there used to be four walls and a floor there and all that remains is the piano? 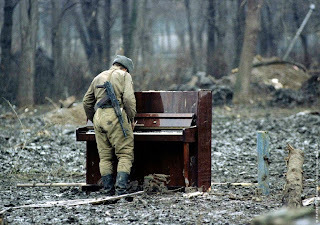 Taken in Chechnya in 1994, this is a Russian soldier caught tinkling the ivories. Looking at the colour photograph, there are clues that begin to add layers of possibility as to the narrative behind this majestic instrument's journey and how it came to be abandoned. 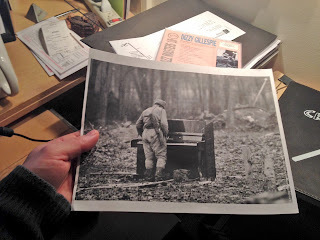 The clues were less revealing on the black and white printout that I used to do my sketch study. Blurred in the distance, beyond the trees, is something. 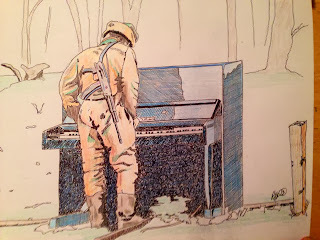 Possibly a building or a vehicle, it leads to the likelihood that the piano might not be in middle of nowhere as it first appeared. There is also a metal rod sticking out of a pile of debris off to the right. It actually looks like it might be a flagpole or something of that nature. The post in the right foreground looks purposeful, perfectly plumb and ready to support a few fence boards or possibly to act as a marker. The more I look at the picture, the more I see, the more I wonder. In any case, I was looking at the black and white version of this shot when I set out to do my sketch. A lot of those details and curiosities didn't reveal themselves. I need a colour printer, as much as the thought of it twists my soul, it would help in my artistic efforts. I'm listening to Dizzy Gillespie's "November Afternoon" with Kenny Barron on the piano, a recording from 1963 in New York. Every time he plays, I glance up at the picture and imagine that the Russian soldier is playing. From a quick pencil sketch to adding in the ink to putting in some colours with pencil crayons, I spent an hour or two with this study on Sunday. Normally, when I sign a piece - my initials and the year - it means it is finished. That was not the case with this one, as it felt increasingly incomplete to me. I decided to sleep on it and spend some time in my head with this Russian soldier. What emerged yesterday, when I got home from work, was a letter to his wife, in English of course, because I don't speak or write Russian. The Forest is a spooky place, full of sounds that fright, brambles that cut and tear, and unknown dangers around the corner. This is my life these days, traipsing through these woods, on endless patrols. I'm tired of this misery, and long to be back home, in your arms, nestled beside you in our warm bed, and being woken up by our darling children. It is this longing, this vision that keeps me going, warms me on these dark cold nights. Thank you for being there in my thoughts and in my dreams. We were patrolling new territory today, a quiet patch of trees near an abandoned village, when we came across a piano in the middle of a clearing. I can't describe the feeling that washed over me as I played those notes, feeling them fill the air with their beauty and perfection. It was everything I see in you transformed into sound waves. There is so much sadness and pain in these pursuits, but in this sonorous moment was complete and utter brilliance. 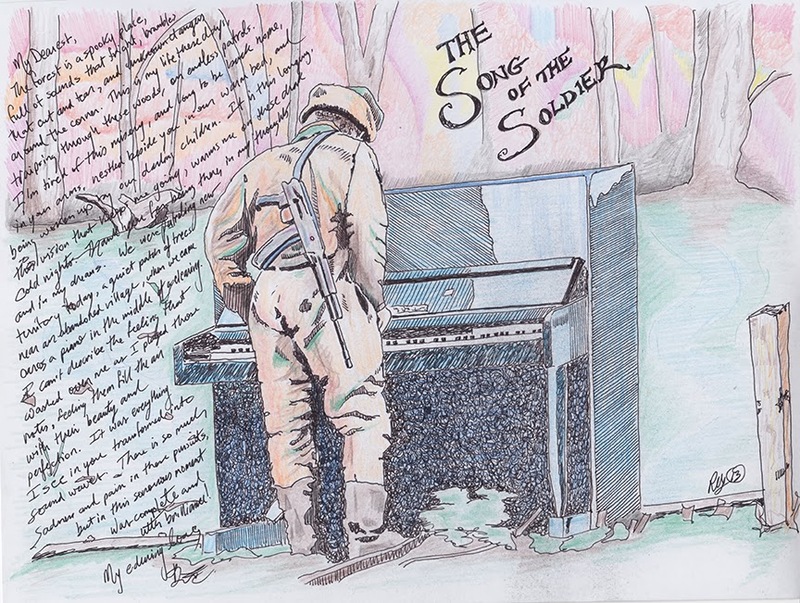 These words spilled from the pen and onto the drawing. I thought about pre-writing it, but something felt wrong about doing that, too contrived, controlled. It needed to be more fluid, authentic, imperfect. 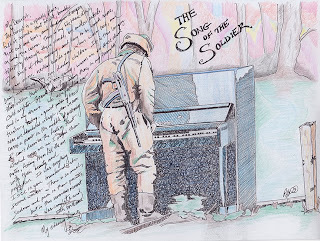 I debated adding the words "The Song of the Soldier" as a title to the piece. In the end, I couldn't walk away until they were there.